In a lot of ways, last night’s PPV, Battleground, was just an extended commercial for WWE’s big summer blowout, Summerslam. Just about every match was good to great, but considering how so many of them ended, it felt like WWE was just teasing what’s to come in August. That means that the prevalent feuds at Battleground largely carry over to tonight’s Raw. Luke Harper’s interference in the Reigns-Wyatt match last night means that those two still have a bone to pick with one another. New Day and their power of positivity aren’t about to settle for losing to the Prime Time Players; they want tag team gold and they’re coming for it. Then, of course, there’s the Undertaker, who returned last night to tombstone Brock Lesnar and let him know that he’s back from the dead and looking for revenge. Bleeding the feuds from last night into the road to Summerslam could be disastrous, but everything on Raw tonight suggests that WWE has everything under control. This is the most consistently entertaining Raw in months. There have been higher highs in the last few weeks, especially with Lesnar, but no episode in recent memory feels as well put together. It helps that this episode is seriously old school. It’s like WWE traveled back to (at least) the Attitude Era and found some booking magic. There are lengthy backstage brawls, real emotion, locker room meetings, bits of humor, and two fabulous Divas matches. Let’s start with those Divas matches. When the NXT women debuted last week, there was understandably some worry that the segment would be the lone high point, the only moment of recognition for these women before getting thrown into garbage matches. Tonight’s Raw proves that WWE is focused on revitalizing the Divas division. Both matches tonight–Charlotte versus Brie Bella, followed later by a tag team match that pits Sasha Banks and Naomi against Paige and Becky Lynch–get a TON of time, and on top of that, the women get to actually wrestle. No nonsense, no pointless cattiness, just straight-up wrestling. It’s remarkable that this is WWE in 2015. The Divas division hasn’t felt this important in years, and considering the roster, we could soon be living through the greatest stretch of women’s wrestling in the history of the WWE. That sounds like hyperbole, but just watch those two matches from tonight again–and that stellar video package about the female talent–and tell me I’m wrong. If a killer Divas division isn’t ’90s enough for you, the show doubles down by giving us the return of the Undertaker to Monday Night Raw. He opens the show with a brooding, angry segment, and it’s the most wonderfully ’90s thing in a night full of that stuff. What works about it is the fact that the Undertaker manages to sell the Summerslam match and justify his motivations without babbling on for 20 minutes. Instead, he tells the audience that he understands that streaks are meant to be broken, that it’s okay that Lesnar conquered him. What he can’t stand is having to hear him and Heyman brag about it week in and week out, month after month. It’s smart writing in terms of motivation because it explains why Undertaker is only now going after Lesnar, and like any great feud, ties in the history between the two wrestlers. Letting the two just trade blows helps too, as their brawl extends into the back and across a commercial break. I’m completely sold on a Undertaker-Lesnar rematch now; don’t let them touch each other again and WWE could really be on to something. Heyman, Brock, Taker, and everyone involved has already built this feud into something special. Here’s hoping the payoff is akin to tonight’s epic showdown. The rest of the night is populated by a handful of solid matches, most of them building feuds for Summerslam. PTP lose to Los Matadores after New Day distracts them by being awesome and positive. Miz gets slaughtered by Big Show, which is to be expected, though I hope Miz wins the IC title at some point. That guy is money, and seriously underrated. Luke Harper’s back in action too, taking on Roman Reigns while Bray Wyatt watches from outside the ring. Those odd numbers won’t stand though, as Dean Ambrose comes out to back up his buddy. I’m always here for the continuing bromance of Reigns and Ambrose, and having them back together and feuding with 2/3 of the Wyatt Family is bringing me back to the good ol’ days of Elimination Chamber 2014. Then there’s that loose, fun main event, a six-man tag match that sees Cena, Orton, and Cesaro facing off against Owens, Sheamus, and Rusev. It’s kind of a house show match, but in the best way possible. I know some people won’t be happy that Rusev ended up all alone by the end of the match, meaning that the three faces all ganged up on him, but that works for me in this type of match. The match isn’t necessarily trying to further any feud (despite the participants and their storylines), so to have a main event that’s structured around guys getting their stuff in and sending the crowd home excited and happy is fine by me. I was smiling ear to ear as Cesaro got the crowd going, delivering the swing to Rusev before catapulting him into an RKO. Raw has a tendency to be dull more often than not. Tonight’s episode was far from it. If you want to nitpick, you could find some issues, but considering WWE’s track record and how much TV time it has to fill, I’ll take a consistent three hours like this every single week. Results: Charlotte defeated Brie Bella; Los Matadores defeated the Prime Time Players; Big Show defeated Miz; Roman Reigns defeated Luke Harper (via DQ); Sasha Banks and Naomi defeated Paige and Becky Lynch; John Cena, Cesaro, and Randy Orton defeated Sheamus, Kevin Owens, and Rusev. How great was Rollins tonight? His promo was a little long, but he was on-point. Very curious to see what comes of his probable feud with Cena. Both Cena and Rollins made good points in their war of words about what it means to be a champ. I like that nuance, that balance. Another great ’90s segment: that backstage locker room meeting where Steph and Triple H tell the superstars that they’re in charge of keeping Lesnar away from Taker. Poor Zack Ryder looks terrified! 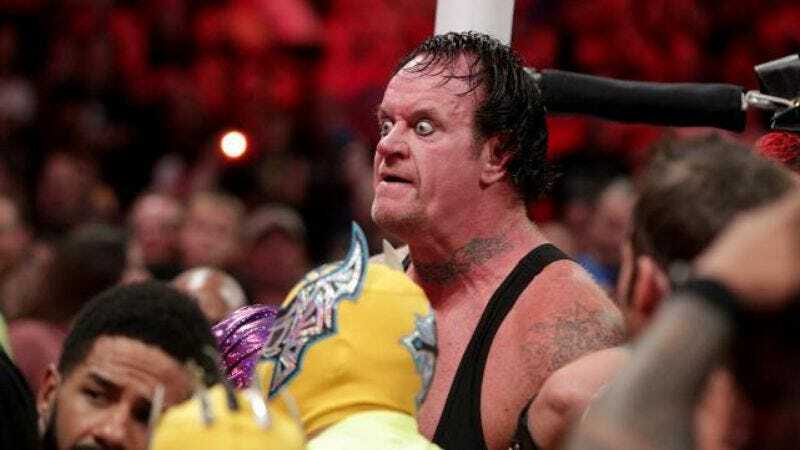 Lesnar: “I’m going to kill you!” Undertaker: “You’re gonna have to!” I got chills. Turns out that the way to make a Bray promo bearable again is to have Harper say a few words too. I love that Rollins made Lilian Garcia announce him as the champ after he missed out on it last night. The Prime Time Players are like the main roster version of NXT’s Enzo and Cass right now. Darren Young is Enzo, just surviving in the ring until he can tag his Big Cass, Titus O’Neil, who then wrecks everyone. I was going to rag on Brie Bella for those sloppy Daniel Bryan kicks–and lambast WWE for letting a heel do them–but tonight’s Raw was just too good to complain about that. The Undertaker was my favorite WWE wrestler growing up. That entrance still makes me giddy. Low-key highlight of the night: New Day mockingly doing the “Millions of Dollars” dance. Also: Titus doing it while holding one of the Matadores.